The entire Luna 23 vehicle (descent stage, ascent stage and Earth-return capsule) landed at an unexpected speed and fell on its side. Enlargement of vehicle in lower left inset; D: descent stage, A: ascent stage. NAC M174868307R [NASA/GSFC/Arizona State University]. Unfortunately, Luna 23 experienced a malfunction and hit the surface at a very high velocity. Contact was maintained between Earth and the spacecraft after landing, but a sample could not be acquired. At the time, the cause of the failure was not known, but it seemed probable that the whole spacecraft tipped over upon landing at an unexpectedly high velocity. 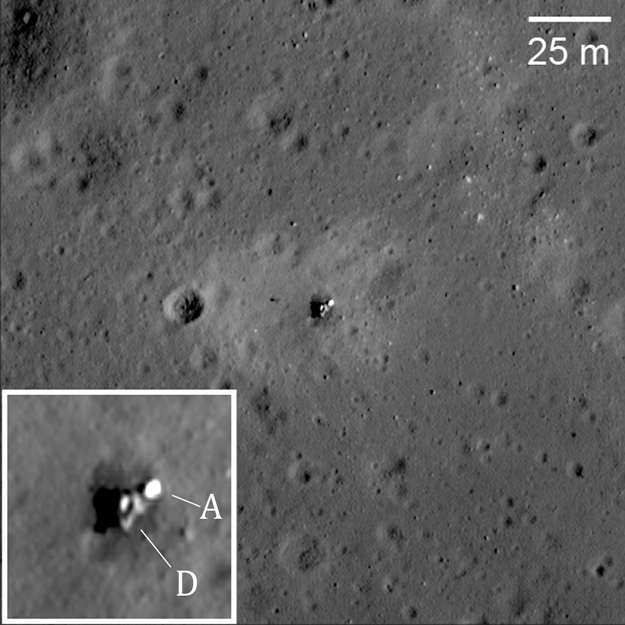 Indeed, the high resolution LROC NAC image (below) shows the spacecraft lying on its side!